Spanner of 5 inch , 10 inch & 20 inch for KENT and Other RO Models. Make it simpler when changing your filters by using this spanner to easily unlock or tighten pre-filter housing .. There will be no more leaks when membrane housings are not tightened properly..
And there will be no more straining.. When you want to open a tightly closed Filtration housing it comes to filter change time..
HM 5 Inch RO Water Purifier Filter Spanner is a premium quality Other Spanners from HM. Moglix is a well-known ecommerce platform for qualitative range of Other Spanners. 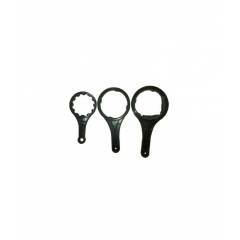 All HM 5 Inch RO Water Purifier Filter Spanner are manufactured by using quality assured material and advanced techniques, which make them up to the standard in this highly challenging field. The materials utilized to manufacture HM 5 Inch RO Water Purifier Filter Spanner, are sourced from the most reliable and official Other Spanners vendors, chosen after performing detailed market surveys. Thus, HM products are widely acknowledged in the market for their high quality. We are dedicatedly involved in providing an excellent quality array of HM Other Spanners.